Lunch boxes can be a nightmare. Too big, too small, ones that leak, ones that end up smelling horrid and ones that simply aren't 'cool' enough. I know we've been through our fair share of them since my children started taking lunches to playschool/school but what's the solution? Well the answer may well be Yumbox. 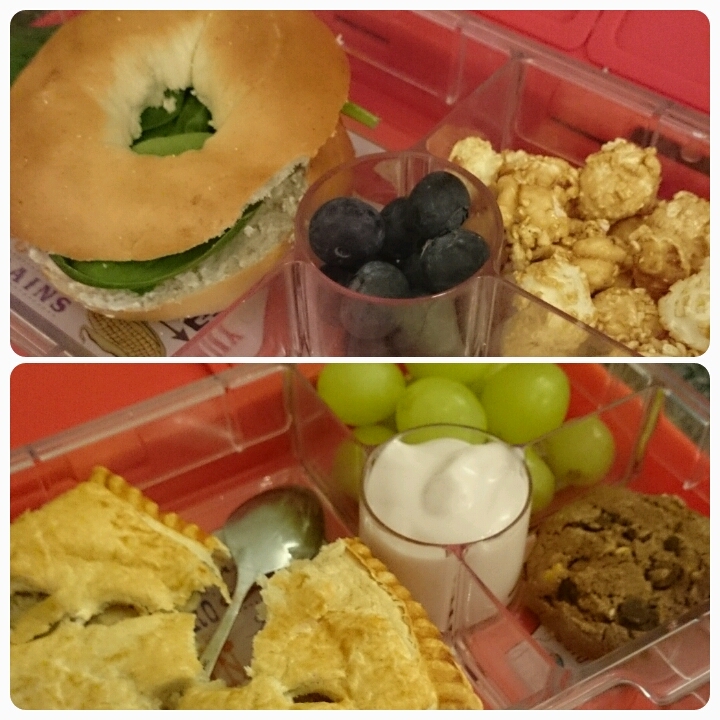 This was a kid friendly bento lunchbox developed by 2 US mums designed to benefit both children and adults. So lets start with the outside of the Yumbox. Designed and made with high quality BPA free materials, this box is both durable and completely safe for your food. I was surprised at just how compact it was considering what was hidden inside (we'll get to that soon). 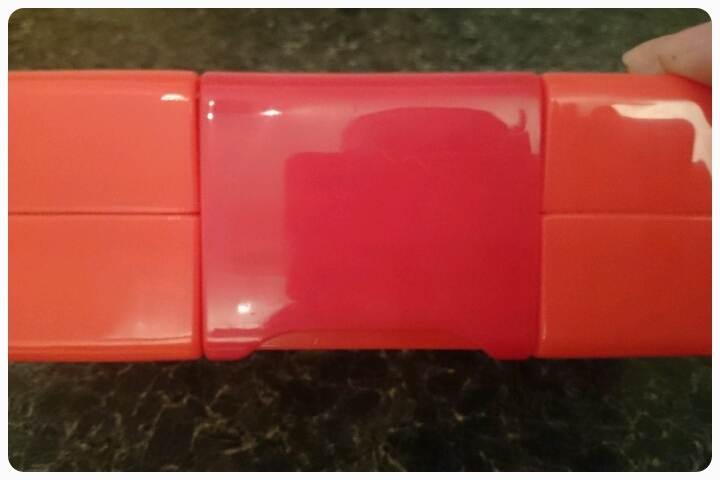 We opted for the colour red but there are other wonderfully bright colours to choose from which make the box look fun straight away and make them stand out so less likely to get lost at school. A child friendly latch makes sure that contents are secure inside. I tested just how child friendly it was with my kids and even my 5 year old, then 4 year old opened and closed it with ease. 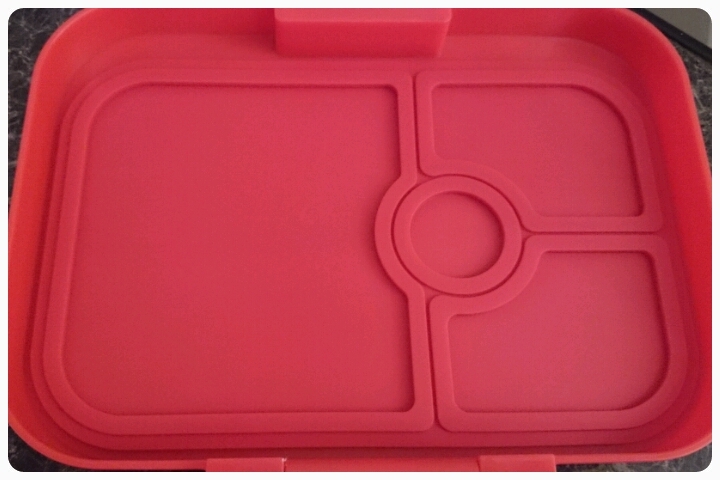 Upon opening we find there is a moulded silicone lid which makes the box leakproof, preventing any unwanted spillages. We've had ruined books etc in bags before from things like yoghurt escaping so this is a reassuring part of the design. I opted for the 4 compartment Panino box because the compartments were larger which I thought was more ideal for things like sandwiches and wraps. However because the trays come out, they are made to be interchangable so you can buy the 6 compartment tray separately if you wish to mix things up but you must be aware that the lid won't seal the same way. 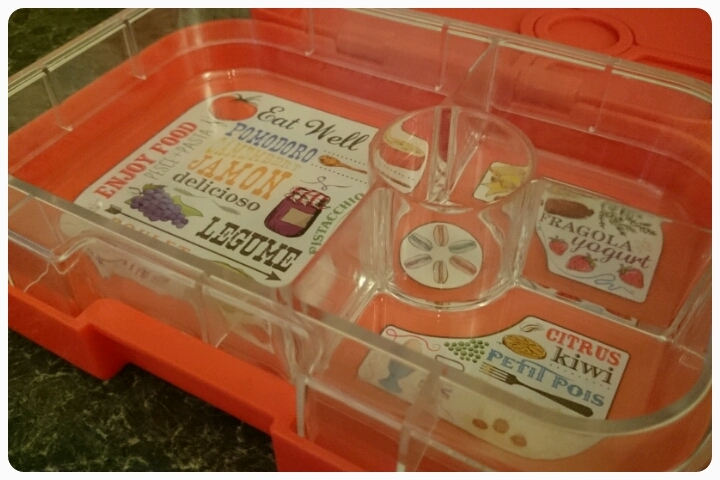 The tray came with wonderful eat well illustrations and wording, giving ideas on just what you could make and put in your box. Being removeable makes the lunchbox almost a joy to clean, no trying to get into tiny creases to get out those pesky crumbs and a big bonus if you are lucky enough to own one, Yumbox is also dishwasher safe. The compartments in the tray encourage portion control and make you think about balancing out that diet more. It made me experiment more with what I gave my daughter for lunch. It was a bit like doing a jigsaw puzzle sometimes as I had to cut the food into small pieces to fit them into the various compartments. 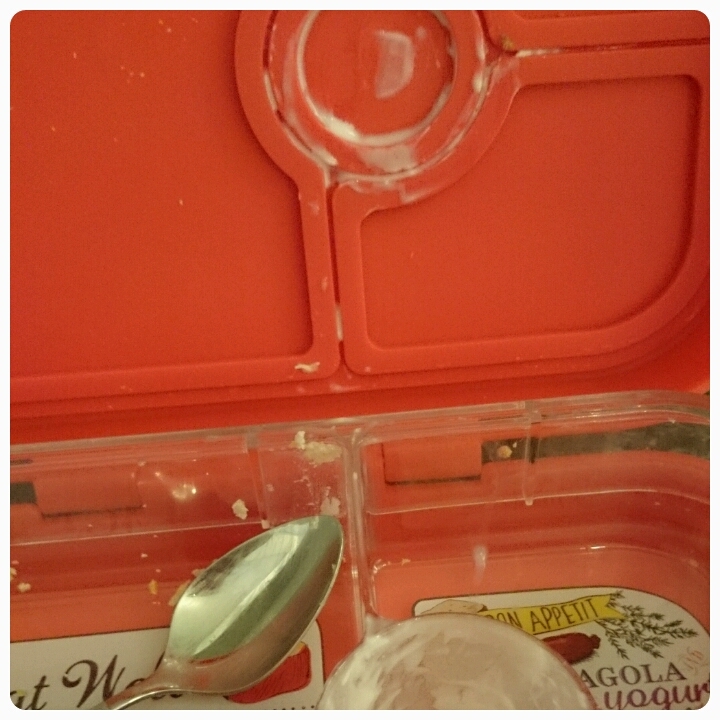 There was one thing I needed to remember, don't over fill the compartments, as they end up getting stuck in the mould of the lid, good job they rinse off easily!! I think the only thing that the tray was missing was a place to put a spoon or fork. Overall my daughter and I give the Yumbox a big thumbs up. It is fun, yet practical and brings a bit of creativity back to lunch time. Disclaimer : I was sent the Yumbox FOC for reviewing purposes however all thoughts and opinions are my own. 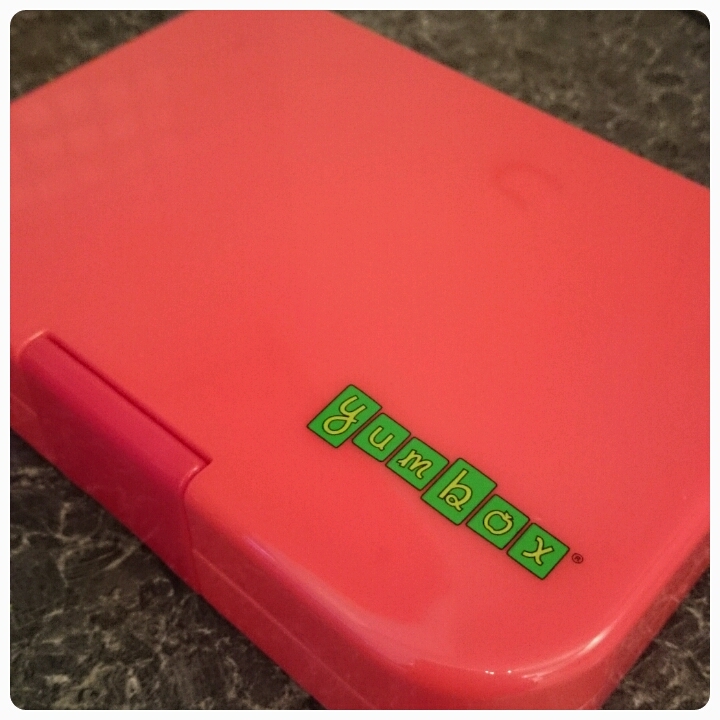 I love my Yumbox - but I must admit I use it for myself and not the kids!